Seven species of fish (Catla catla, Cirrhinus mrigala, Cyprinus carpio, Hypophthalmicthys molitrix, Labeo rohita, Mori-Rahu Hybrid and Thalla-Rahu Hybrid) were collected from a brackish water pond near Muzaffargarh, Pakistan for the comparison of body composition. All the seven species were found relatively well adapted to the saline environment though some of them showed significant differences in body composition. Results obtained did not show any adverse effect of salinity on these fish species. The mean values of body constituents, except for protein content (dry and wet bodyweight) differed significantly (P<0.05) among various fish species. Minimum amount ofwater content andmaximum amount of lipids, organic content and condition factor were observed in Cyprinus carpio indicating that Cyprinus carpio show overall better growth in brackish water as compared to other species. Cyprinus carpio may be recommended for culturing in such water bodies and farmers may be encouraged to farm this species on mass scale. Fish growth is influenced by a number of factors including food, space, temperature, salinity, season and physical activity. Since fish are poikilothermic and live permanently immersed in water, they are directly affected by changes in their ambient medium (Weatherly and Gill, 1987). The term growth will signify change in magnitude. The variable undergoing change may be the length or other physical dimensions, including volume, weight, or mass either of an organism’s whole body or its various tissues or it may relate to lipids, protein content, or other chemical constituent of the body. Growth may also relate to the change in the number of animals in population (Weatherly and Gill, 1987). Body composition is a good indicator of the physiological condition of a fish but it is relatively time consuming to measure. Proximate body composition is the analysis of water, fat, protein and ash contents of fish. Carbohydrates and non-protein compounds are present in negligible amount and are usually ignored for routine analysis (Cui and Wootton, 1988). The percentage of water is good indicator of its relative contents of energy, proteins and lipids. The lower the percentage of water, greater the lipids and protein contents and higher the energy density of the fish (Dempson, et al., 2004). However, these values vary considerably within and between species, size, sexual condition, feeding season and physical activity. Protein content, which is important component, tends to vary little in healthy fish (Weatherly and Gills, 1987). There is a wealth of literature available on body composition of various fish species (Berg, et al., 2000, Dawson and Grimm, 1980, Dempson, et al., 2004, Grayton and Beamish, 1997; Jobling, 1980, Jonsson and Jonsson, 1998; Salam and Davies, 1994; Shearer, 1984; Weatherley and Gill, 1987). However, little is known about the growth of fish found in brackish water in Pakistan. In southern Punjab, there is a shortage of fresh water with problem of increasing salinity (Davidson, 2000). As a result, culture of fresh water fish is challenging in these areas. The present study was aimed at testing growth of various fish species using the body composition as an index of growth in a brackish water pond. If some species are performing better in brackish water then farmers can be encouraged to culture those species. The collection of fish species was carried out at a brackish water pond situated at Shahgarh about 18 km. away from Muzaffargarh, Pakistan durimg 2004. Analyses of body composition was done at Institute od Pure and Applied Biology, Bhauddin Zakariya University, Multan following shipping the specimen to lab. The present study was carried out on seven fish species cultured in brackish water pond situated at Shahgarh about 18 kilometers away from Muzaffargarh, Pakistan. The pond was spread over an area of about one hectare with a depth of about 1.75 meters. The fish species collected included Catla catla, Cirrhinus mrigala, Cyprinus carpio, Hypophthalmicthys molitrix, Labeo rohita, Mori-Rahu Hybrid and Thalla-Rahu Hybrid. Using heavy anesthetic MS222, these fish were killed, blotted dry and weighed. Water content was determined by placing the whole fish in a pre-weighed aluminum foil tray for drying in an electric oven at 65-80oC till constant weight. Ash content was estimated by burning 500 mg of sample in a pre-weighed heat resistant China clay crucible placed in a Muffle furnace for 7 hours at 500 oC and reweighed after cooling. Lipid content was estimated by dry extraction following the method of Bligh and Dyer (1959), and Salam and Davies (1994). Powdered dry tissue (3 mg.) was mixed into 10 mL solution of chloroform and methanol (in the ratio 1:2), and stirred with a glass rod. The resultant mixture was left over night and then centrifuged. After centrifugation, the clear supernatant was removed carefully into washed, dried and pre-weighed small bottles. These bottles were then put in an oven at 40 to 50 oC to evaporate the solvent leaving the lipid fraction. Total protein in dry mass was calculated by the difference method from the mass of other main constituents like ash, lipid and water (Caulton and Bursell, 1977; Dawson and Grimm, 1980; Salam and Davies, 1994; Dempson, et al., 2004). Carbohydrates do not form a major component of fish and thus are generally neglected due to their negligible amounts (Elliott 1976, Caulton and Bursell, 1977, Salam and Davies, 1994). Data were analyzed statistically using analysis of variance procedures, and means were compared with the LSD multiple mean comparison test at P < 0.001 unless otherwise stated. Water content was significantly (P<0.01) different between species (Table 1). The maximum water content was observed in Labeo rohita while minimum was observed in Cyprinus carpio. Interspecies comparison showed that Labeo rohita and Hypopthtalmicthys molitrix showed same water content which was significantly (P<0.05) different from Mori-Rahu Hybrid, Thalla-Rahu Hybrid, Catla catla and Cirrhinus mrigala. 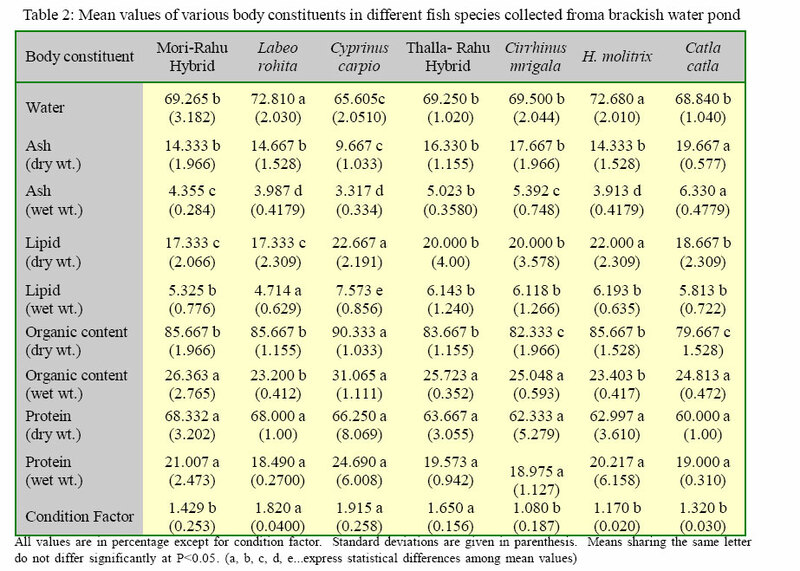 However, Cyprinus carpio had significantly (P<0.05) lower water content than all the fish species (Table 2). Various fish species showed a highly significant (P<0.001) difference in ash content on dry and wet weight basis (Table 1). Maximum ash content (dry and wet weight) was observed in Catla catla while minimum values (dry body weight) were found in Hypophthalmicthys molitrix and in Mori-Rhou Hybrid. Cyprinus carpio showed minimum values of ash in wet body weight of fish. Interspecies comparison showed that all fish species differed significantly from each other in ash contents (dry and wet body weight). Some species showed similar trend with respect to ash contents while some of them showed significant difference with one another (Table 2). Lipid content (dry body weight) varied significantly (P<0.05) between species (Table 1). Cyprinus carpio showed the maximum while Labeo rohita and Mori-Rhou Hybrid showed the minimum lipid content (dry body mass). The lipid content was higher in Cyprinus carpio than other species (Table 2). Lipid (wet body weight) showed significant difference (P<0.01) between species. Maximum amount of lipids (wet body weight) was observed in Cyprinus carpio while minimum amount was found in Labeo rohita. Interspecies comparison showed that all fish species differed significantly (P<0.05) from each other in lipid contents (dry and wet body weight). Some species contained same lipid content while other showed significant (P<0.05) difference from each other (Table 2). There was highly significant (P<0.001) difference in organic content (dry and wet body weight) between species (Table 1). The organic content was highest in Cyprinus carpio (both dry and wet body weight) while it was lowest in Catla catla on dry weight basis and in Labeo rohita for wet weight basis. Interspecies comparison of fish species showed significant (P<0.05) difference in organic contents (dry and wet body weight). Some species showed same amount of organic content while other showed significant (P<0.05) different amount from each other (Table 2). There was non-significant (P<0.05) difference between species in relation to protein content on dry and wet body weight basis (Table 1). The maximum value of protein content (dry and wet body weight) was observed in Mori-Rhou Hybrid, which was non-significantly different from remaining fish species. The lowest amount of protein content was found in Cirrhinus mrigala (Table 2). There was highly significant (P<0.001) differenceetween species in condition factor (Table 1). The condition factor was highest in Cyprinus carpio and lowest in Cirrhinus mrigala. Interspecies comparison showed that all fish species differed significantly (P<0.05) from each other in ash contents (dry and wet body weight). Most species showed different trend from each other with respect to condition factor (Table 2). Pakistan is faced with major problem of water logging and salinity (Qureshi and Barrett-Lennard 1998).A number of saline water bodies are found in irrigated Punjab in the form of lakes and ponds.The successful economic use of these resources depends on adopting the fish rather than adopting the environment.Results from the current study indicated that body composition varied significantly among the various fish species in brackish water pond. The maximum water content was observed in Labeo rohita while minimum was observed in Cyprinus carpio. This was reversed in case of lipid content. Cyprinus carpio showed the maximum lipid content while Labeo rohita and Mori-Rhou Hybrid showed the minimum lipid content. The condition factor was highest in Cyprinus carpio and lowest in Cirrhinus mrigala. The differences suggested that variable rearing conditions within the brackish water system might influence body composition. This could be related to physiological adaptations of various species to acclimatize in brackish water pond. When interspecies comparisons were made in pond under study, no consistent results were obtained. For same body composition, some species responded in similar fashion while others showed significantly different results (Table 2). This may be due to the interaction of several factors like food, space, temperature, salinity, season and physical activity. This research is a pioneer study of body composition of fish species in brackish water and provides indirect evidence using body composition as an indicator of fish growth. Results obtained do not reflect any adverse effect of salinity on these fish species. All the seven species were found relatively well adapted to the saline environment though some fish species showed significant differences in body composition. of all the fish species examined, Cyprinus carpio showed better growth in brackish water and may be recommended for culturing in such water bodies on mass scale by the farmers. Tremendous facilities extended by the Institute are gratefully acknowledged. The manuscript was complied when one ofthe authors, MohammadAthar (Tariq) was visiting professor at Institute of Pure andApplied Biology, Bahauddin Zakariya University, Multan, Pakistan under foreign faculty hiring program of Higher Education Comission, Islamabad. Bligh E. G. and Dyer W. J. A., (1959). Rapid method of total lipid extraction and purification. Can. J. Biochem. Physiol., 37, 911-917. Berg O. K., Thronaes E. and Bremset G.,(2000). Seasonal changes in body composition in young riverine Atlantic salmon and brown trout. J. Fish Biol., 52, 1272-1288. Caulton M. S. and Bursell E., (1977). The relationship between changes in condition and body composition in young Tilapia rendalli. J. Fish Biol., 2, 1443-1450. Cui Y. and Wootton R. J., (1988). Bioenergetics of growth of Cyprinids, Phoxinus, the effect of the ration and temperature on growth rate and efficiency. J. Fish Biol., 33, 763-773. Davidson A. P., Soil salinity, a major constraint to irrigated agriculture in the Punjab region of Pakistan: Contributing factors and strategies for amelioration. Amer. J. Alternat. Agric.,15, 154-159. Dawson A. S. and Grimm A. S., (1980). Quantitative seasonal changes in the protein, lipid and energy contents of carass, overies and liver of adult female Plaice (Pleuronectes platena L). J. Fish Biol., 16, 493-495. Dempson I. B., Schwarz C. J., Shears M. and Furey G., (2004). Comparative proximate body composition of Atlantic salmon with emphasis on parr from fluvial and lacustrine habitats. J. Fish Biol., 64, 1257-1271. Elliot J. M., (1976). Body composition of brown trout (Salmo trutta L.) in relation to temperature and ration size. J. Anim. Ecol., 45, 273-289. Grayton B. D. and Beamish F. W. H., (1997). Effects of feeding frequency on food intake growth and body composition of rainbow trout (Salmo gairdneri). Aquaculture, 11, 159-172. Jackson A. J., (1977). Reducing trout mortalities after seawater transfer. J. Fish Farming Internat., 4, 31-32. Jobling M., (1980). Effect of starvation on proximate chemical composition and energy utilization in Plaice (Plueronectes platesse L). J. Fish Biol., 17, 325-334. Jonsson N. and Jonsson B., (1998). Body composition and energy allocation in life history stages of brown trout. J. Fish Biol., 53, 13-15. Qureshi R. and Barrett-Lennard E., (1998). Saline Agriculture for Irrigated Land in Pakistan: A Handbook. Australian Center for International Agricultural Research, Canberra. Salam A. and Davies P. M. C., (1994). Body composition of Northern Pike (Esox lucius L.) in relation to body size and condition factor. J. Fish Res., 19, 193-204. Shearer K. D., (1984). Changes in the elemental composition of hatchery reared rainbow trout (Salmo gairdneri) associated with growth and reproduction. Can. J. Fish. Aqua. Sci., 41, 1592-1600. Weatherly A. H. and Gill H. S., (1987). The Biology of Fish Growth. Academic Press, London.